On the ground floor there is a large living room with fireplace, satellite TV, an open plan kitchen/dining area which is fully equipped, and a twin bedroom with en suite bathroom. An internal staircase leads upstairs where there are 2 additional bedrooms; 1 double bedroom with a balcony overlooking the sea, and a twin bedroom. There is also a family bathroom on this level. Villa Garifallia can sleep up to 6 people. Outside there is an attractive garden with swimming pool, sunbeds and umbrellas, BBQ and outside grill along with outside dining and patio furniture. Great location for us as a group (two couples).It was out in the countryside which we like , but only a couple of miles from shops and restaurants. 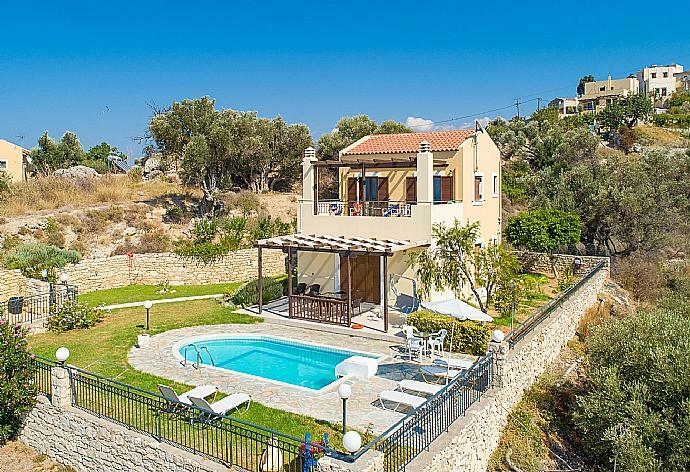 We have been hiring villas all over Europe for the last 25 years , and this was only our second visit to Greece (both via Agni travel) , and we were not disappointed ! Excellent service from everyone. Thank you. We have just returned from the most fantastic 12 day holiday in Villa Garifallia. The villa was spotlessly clean and comfortable but it was the outside space that sets the villa apart. Gorgeous and fragrant bougainvillea framed the most breathtaking Mediterranean Sea view, ever changing and with the most glorious sunsets. We spent many a happy evening playing cards on the outside terraces both upstairs and downstairs. The pool was a very welcome oasis during the heat of the day and it too, was kept spotlessly clean by the very friendly Costos, who also worked at Katetina taverna 5mins walk from the villa. Very worth a visit to meet some super friendly and welcoming locals namely Valandes and Michael. Trips worth taking are Spinaloga, the monastery at Arkadi, and the pyschros caves although be warned very steep climb up to and down into the caves. We had an automatic car for the entire holiday which we made use of every day, even if only just for a trip to Rethymno to stroll along the beach. Would advise though a four wheel drive or at least a manual, as the roads can be very steep, somewhat challenging and not always paved!!! There is so much to discover on Crete its a magical place full of history and with wonderfully warm people. We will definitely be back and would highly recommend Villa Garifallia and Agni Travel. Our Family of 4 had a very relaxing 10 day stay at the Villa. Maid Service was excellent and friendly. 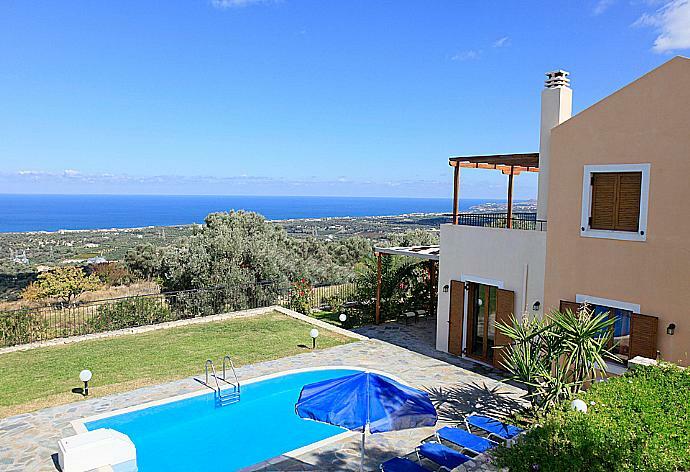 The views are stunning and the outside area surrounding the villa is what sets this property apart. Car hire was going to cost between 30 -35 Euros per day and a Taxi Transfer to Rethymno takes about 10 mins and costs 30 Euros return. We decided not to hire car as it costs about the same as taxis and we could all enjoy a drink and not worry about driving. We just stocked up on supplies before getting the taxi back at night. That said we were the only family without a car in comparison with all the families staying at the other 3 villas. I think most people would recommend having a car, but its a personal choice. You must visit the Taverna Katerina in the village. The host called Vilades is a true character, the views are wonderful and the food is great. The village is like stepping back in time and is very quite, but has a special feel to it. You get a true taste of the real Greece far removed from the tourist trail. Everybody is so very friendly. The WI-FI is OK but our Kids 16 & 14 didnt think it was consistent and didnt extend to the upstair bedrooms. Not a huge deal though. I would recommend Agni Travel and also this Villa, if you want a relaxing holiday round the pool. Writing this on the last day of 10 in Villa Garifallia. What you see in the pictures and description is exactly what you get in the property. The road up from Rethymon is steep and a car is essential but once at the villa it is extremely peaceful and has fabulous views. Internally the property has everything you need and is fairly well equipped but the villa is all about the outside space - the balconies upstairs and downstairs and the pool. Although the villa is one of four properties behind a gated entrance, it is not overlooked and the natural rock next to BBQ makes the garden very secluded. The Wi-fi works OK as do the aircon units for each of the rooms. Also the shutters for the bedrooms are very good and you can stop any early morning light coming in if you wish. The walk to the Taverna Katerina is short but steeply uphill and it has great views and friendly owners. However, driving through Maroulas is not easy due to the nature of the road and the odd parked car. There are plenty of supermarkets in Platanes to get your supplies and the BBQ is a good size. 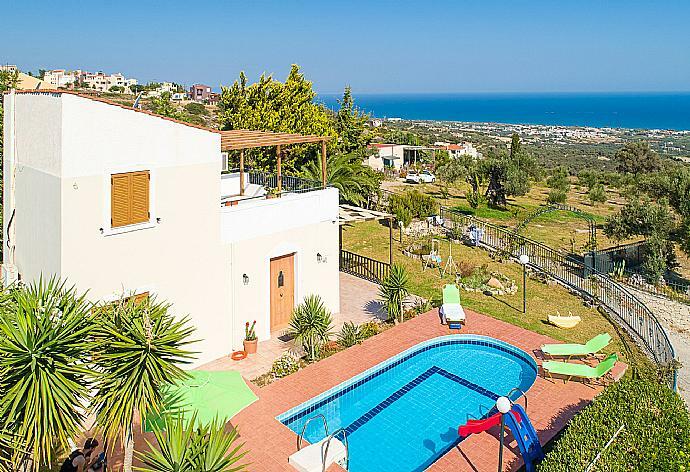 We would thoroughly recommend the villa if you want a tranquil location and fabulous views and, with a car, it only takes 10 minutes to get to the numerous beach bars along the road from Platanas to Rethymon. Would we come back to the villa ...... yes. Would we use Agni travel again ....... definitely yes. A couple of minor issues at the start of our stay were resolved promptly and effectively by the Agni Team-many thanks for this. Really loved this location on the edge of picturesque Maroulas village but close to lots of other busy places and tourist attractions - a perfect compromise for us. Would have loved to see what the place was like in slightly higher season and a little better weather. Overall we thoroughly enjoyed our stay. We enjoyed our holiday. The cleaners were excellent throughout our stay and the bedding and towels changed every few days. We had a problem with the iron not working but this was solved with a new one being provided within a few hours. 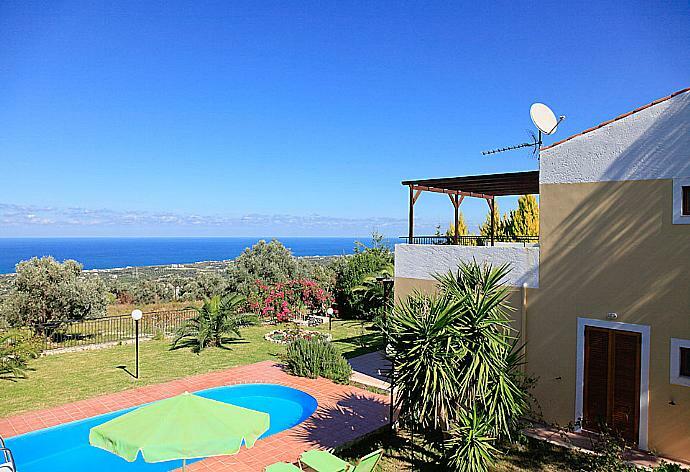 I would recommend this property as the views are stunning and the villa well equipped. The villa was fantastic and even better than the photos description on the website - the view was amazing. The villa was clean and comfortable. We thoroughly enjoyed our stay and the view was excellent. We had a great time. A small problem we had was resolved extremely quickly. Make sure you visit Taverna Katerina in Maroulas. Lovely villa and locals very friendly, lovely pool. Excellent holiday. Very nice house and perfect location. Restaurants in walking distance. We recommend Tavna Taverna, half an hour to walk. We had a good a good time the house and the view is Great. We would like like to come back one day. Excellent location, very quiet. Response when a request was made was immediate. We had an excellent holiday. Beautiful villa very friendly owners. Unbelievable view.Will certainly return to this location. We have had quiet days in a excellent property. Many thanks to the friendly housemaid. We had a very enjoyable stay. Beautiful location if you want to get away from it all into the real Crete this villa is for you Amazingly friendly people everywhere we went. Very very sad to leave. We had a lovely holiday at Villa Garifallia. It had everything we needed for an enjoyable weeks holiday. Very clean, spacious, lovely garden with a great view. Good base for exploring this area of Crete. 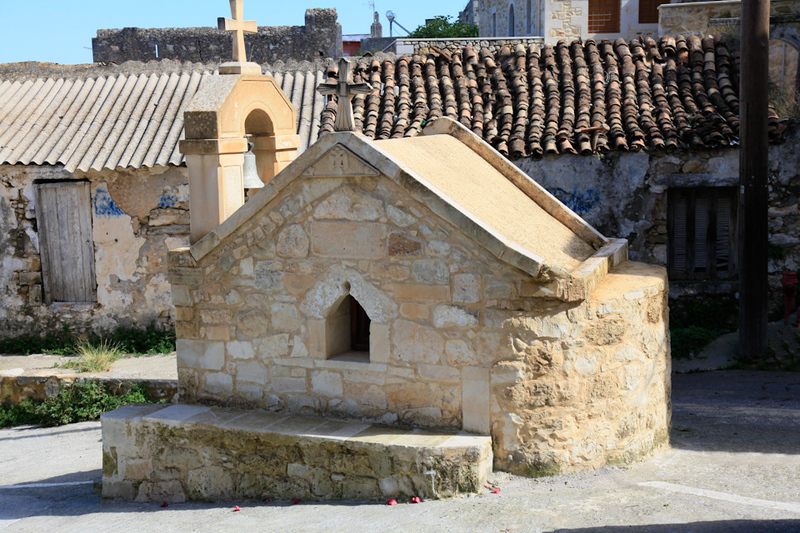 Maroulas is a picturesque medieval village set above the bay of Rethymnon. The village is a UNESCO heritage site and features two watchtowers from the times of the Venetians. The cobbled streets and stone paths serve pretty whitewashed houses, three little tavernas and a few local shops. The village, although very quiet, is just a few minutes away by car from the town of Rethymnon, and 3km from some of the most outstanding beaches in the area. Villa Garifallia was booked 3 days ago!